Senator Grace Poe Llamanzares. Photo from her facebook page. Presidential candidate Sen. Grace Poe on Tuesday admitted she was surprised by a photograph showing her running mate Sen. Francis ‘Chiz’ Escudero and opposition standard-bearer Vice President Jejomar Binay having lunch meeting in Davao. Poe, however, clarified she found nothing unusual with it considering even rivals in politics would really find themselves in one event. ”I was surprised when I saw the picture. For me, it’s not unusual that there are events where you would meet your rival from other (political) party. What’s important is respect, the respect to each other,” Poe said in a media interview after delivering speech in a presidential forum hosted by the Philippine Chamber of Commerce and Industry. A photo reportedly released by Binay’s camp showed the Vice President and Escudero enjoying lunch hosted by former Davao del Norte Rep. Antonio Floirendo Jr.
Escudero confirmed the invitation by Floirendo but clarified that it was not a secret meeting. ”If there are ill intentions, it will not be made in public. 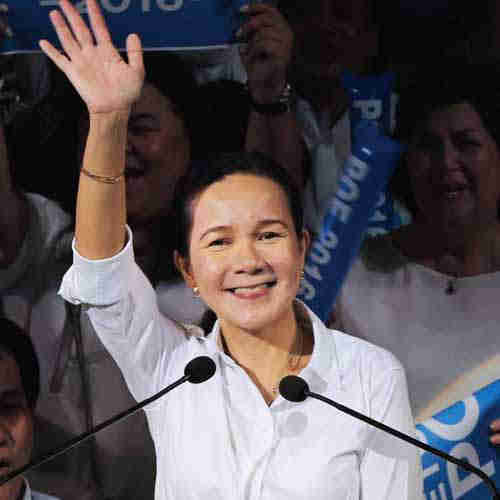 It is an open meeting,” Poe, a leading presidential candidate, said. Escudero endorsed the candidacy of Binay when the latter ran for vice president in the 2010 elections but their alliance turned sour when Binay-led United National Alliance (UNA) dropped Escudero and Poe as guest senatorial candidates in the 2013 senatorial elections. Meanwhile, Poe and Escudero are set to announce their complete senatorial lineup on Thursday at the Club Filipino in Greenhills, San Juan. Poe confirmed that former Senator Panfilo Lacson has been dropped from their senatorial ticket in favor of actor Edu Manzano. She explained that they initially invited Lacson but when the former senator filed his certificate of candidacy, he has been included in the line-up of the ruling Liberal Party (LP) and opposition United Nationalist Alliance (UNA). ”Now, there are others who have no support but can be given the opportunity to serve,” she said. Poe has described their senatorial lineup as ‘unification’ ticket. This entry was posted in ELECTION, MANILA, NEWS and tagged elections 2016, Philippine Chamber of Commerce and Industry, Sen. Grace Poe, United Nationalist Alliance. Bookmark the permalink.